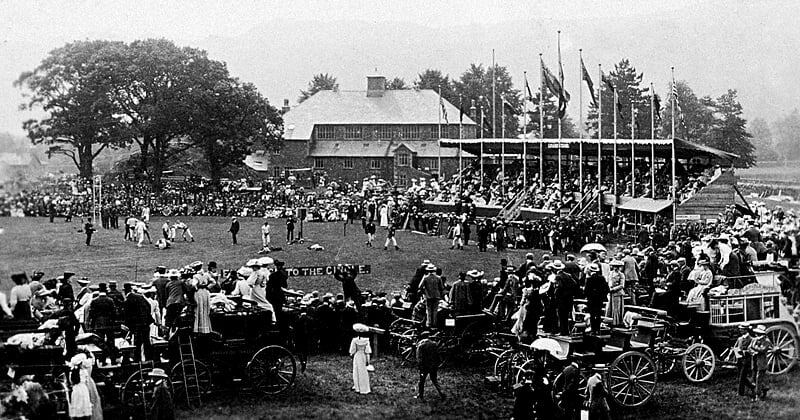 The Sports of 1909 were held in the Broadgate Meadow field next to the Village Hall. 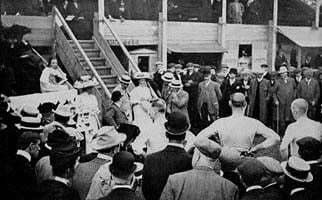 They moved there in 1904 after the Pavement End contract was terminated, and this was the regular venue until after the first World War when in 1919 the Sports moved to their current location at 'Shed Field'. 1909 was the year when the motor car appeared on the scene in any numbers. For the first time a large part of the field was given over to a temporary car park as well as a bicycle park. Horse drawn carriages were still parked around the arena to act as 'grandstands' for their occupants. The Guides race was run in fine weather. 14 runners took part and Metcalfe and Fleming led the field on the way up, but it was Thomas who rounded the flag first at the top of Butter Crags. Fleming damaged his ankle and required treatment after finishing, but nevertheless finished second to Dalzell. Dalzell rounded the flag second in a time of 14mins 10secs and his finishing time of 16mins 42.6secs was a new record for this course. 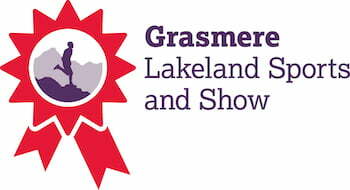 Dalzell won the Guides Race at Grasmere 7 times in all, breaking the record 4 times. It was once reported that Lord Lonsdale (The Yellow Earl) a famous patron of the Sports, planned to invite Dalzell to run in India, but the Great War intervened. The Guides Race entries image above contains names of some famous Guides Race Champions. R(obert) Conchie is probably the younger brother of Tom and Charlie Conchie, both of whom were Fell runners with Tom being the more famous. He had won the race 5 times over the Pavement End course. If this was Robert Conchie, he must have been very young at the time - about 13 or 14 years old, but he was already classed as an 'up coming young runner'. 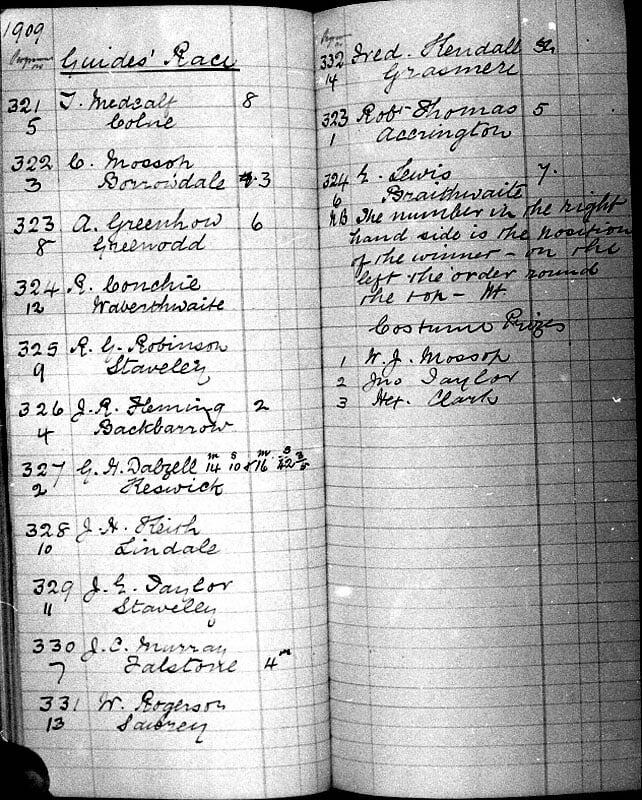 The Under 16's Guides race did not begin until 1920. Conchie could only finish 12th out of 14 on this course. Sadly Robert was killed in 1915 in the Dardanelles at the age of only 19. Dalzell suffered the same fate at Monchy in France on May 19th 1917 at the age of 32. 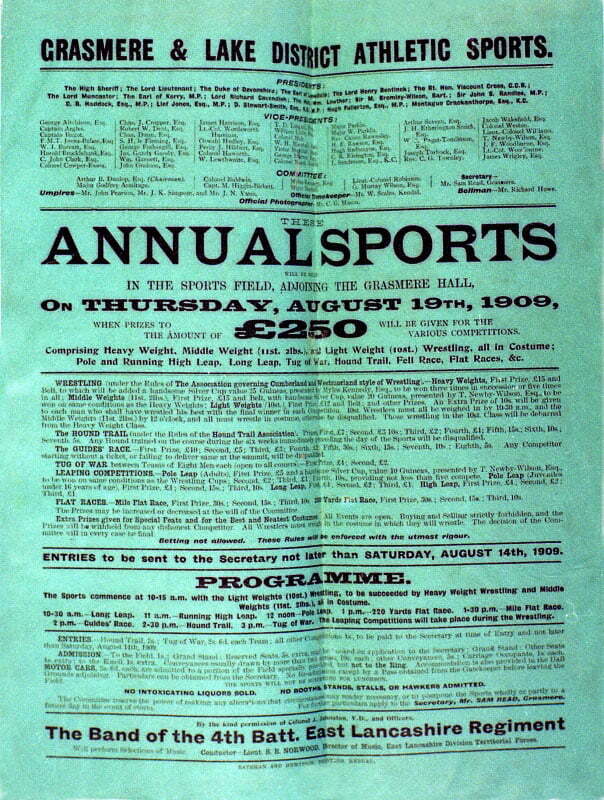 J. C. Murray had won the event 4 times in succession in 1901/2/3/4 but could only manage 4th on this occasion. J. R. Fleming went on to win in 1911 and 1912.